This humanoid creature has long, sharp teeth, and its pallid flesh is stretched tightly over its starved frame. Gross! Set in an undead infested rural property, this SoundSet is likely to get every Cleric reaching for her holy symbol and every Barbarian cracking his knuckles! This is a breakout SoundSet from the Pathfinder Adventure Path SoundPacks. If you are a subscriber you will automatically gain ownership of this SoundSet. 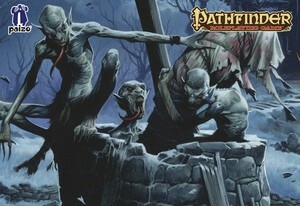 Ghoul Battle SoundSet © 2014 Paizo Inc. Paizo Inc., the Paizo golem logo, Pathfinder, and Pathfinder Adventure Path are trademarks of Paizo Inc. Sounds created under license with Paizo Inc.